From the desk of … Dawn Clark! From the Desk of Dawn Clark! This is where all of my writing is done. Squiggly Central…we like to call it. I love the color of my office. The walls are hunter green and the desk is black. The windows bring in such amazing light. I feel so calm at my desk. I like to write early in the morning and late at night. Although I am really inspired in the morning when my family is sleeping soundly and the birds are chirping right outside of my window. You can smell the spring flowers too. Squiggly Gets Glasses is on my desk to inspire me. On the wall behind my desk are family portraits of our parents and grandparents in black and white. A work table is stationed directly to the right of me with baskets filled with upcoming event information. I have been working on Squiggly’s next adventure. When I write…well I don’t write…I scribble and only I can understand my scribbles. Then I bring it to the computer and refer to my notes. Creating stories where families can come together is so important and I love being a part of that. I feel that a comfortable, creative atmosphere makes this journey so much more enjoyable. 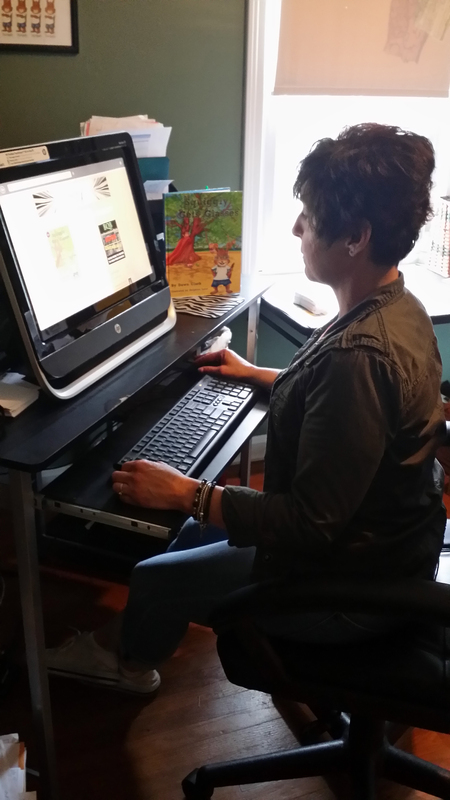 Thank you, Dawn, for giving us this peek into your private writing corner!